A once in a lifetime opportunity to acquire this wonderful 4/5 bedroom family home which has been architecturally designed in the most fantastic style sitting on a plot of land measuring over 1 Rai. It's not often we are instructed to sell such a property, and, it’s pleasing to say that the excitement and enthusiasm we felt when entering the circular driveway was still with us when we left after our guided tour by the owner who has built this property from scratch, turning a most ambitious vision into reality. The attention to detail, mixed use of imported and local fine materials and craftsmanship, and, top quality finish is experienced in every step as you make your way through this wonderful dream home. Expansive accommodation spread over 2 floors, separate staff quarters with 2 bedrooms and 2 bathrooms in the 2 storey outhouse, separate garage, large private swimming pool with deep end. Sprawling mature gardens with huge mango trees, palms and wildlife. Inviting circular driveway with off street parking for multiple vehicles and 70 year old mango tree and Koi Pond as the central focal point. The ground floor is amazing, you enter into a huge lobby dome area which has what we could only describe as different wings in each direction with lounge, dining room, amazing European kitchen and bedroom with en-suite. Upstairs there are 4 further bedrooms each with en-suite and dressing room all coming off the landing which has a view point to the ground floor lobby as you tour round. The balcony is accessed from 3 of the bedrooms wrapping around the second floor of the property with a separate balcony coming off the 4th bedroom. The ceilings are the highest I have seen in a house in the area and there is a fantastic airy feel throughout. What can we say about the fixtures and fittings? Imported hand crafted wooden doors from Bali, the most welcoming of kitchens with full appliances, Parquet wood flooring of different styles in every room, you really have to come and view this property to appreciate the finish that has been achieved, it really does blow you away. Externally there is a separate outhouse used currently as staff quarters with 2 bedrooms and 2 bathrooms, separate garage, large private swimming pool with deep end, sprawling mature gardens with huge mango trees, palms and wildlife and very large circular driveway with off street parking for multiple vehicles and 70 year old mango tree as the central focal point. 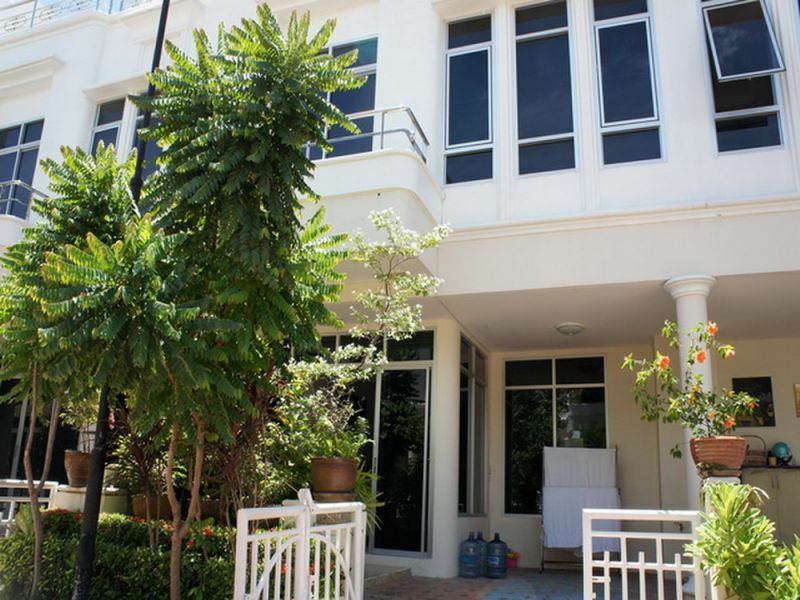 Located within 300m of the beach in Wongamat the location is marvelous with local amenities in abundance, so close to Terminal 21 but yet feeling so far. The Baht Bus is accessed at the end of the road, all major ports are linked via the Sukhumvit which is easily reached from the property linking Bangkok, Rayong, Sri Racha, Utapao and more. Offered for sale in Company Name Ownership with taxes and transfer fees and sale price payment negotiable. Accommodation overview below... Ground Floor: - Welcome hall in the middle of the house. - Built-in European kitchen witk all appliances, and utility room with washer and dryer. - Living room with pool views. - Dining room looking over swimming pool plus guest toilet - Guest en-suite bedroom with walk-in closet and bathroom with hot water shower. Upstairs: - Master bedroom with en-suite bathroom (Jacuzzi tub) and walk-in closet, access to terrace with pool views. - Second bedroom with en-suite bathroom and walk-in closet, access to terrace with pool views. - Third bedroom with en-suite bathroom and walk-in closet with private balcony overlooking to the front gate. - Foruth bedroom with en-suite bathroom and walk-in closet no balcony. Outdoor: - Maid's quarters with 2 beds / 2 baths. - Multiple parking spaces, circular driveway. - Private gardens and swimming pool. - Koi pond.